This is a brief explanation of the translation of words to image to meaning. 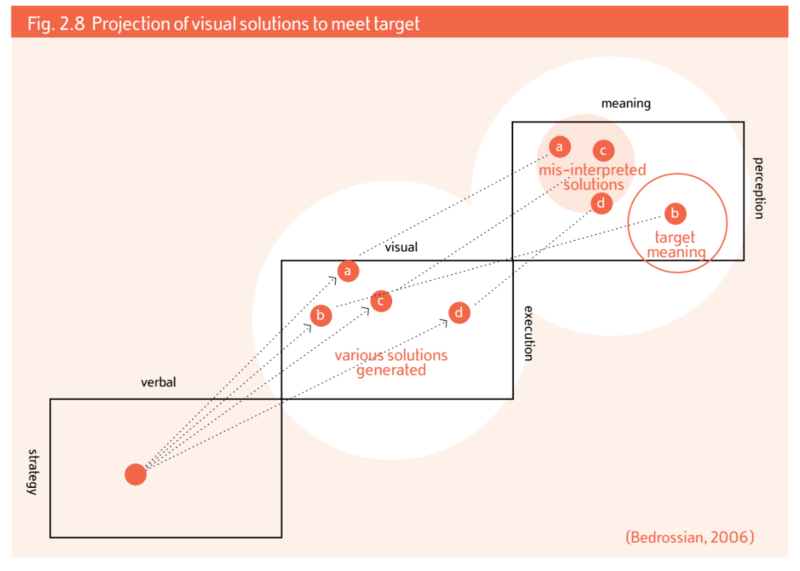 The structure and composition of a visual language creates a direct impact on the meaning to be conveyed. The diagram above, Fig. 2.8, illustrates how the designer progresses from a verbal, strategic domain to the visual execution, and how he creates possible solutions A, B, C, and D (see the first and second squares). Brand identity development necessitates a number of communication objectives that visual executions must fulfill. Once the public sees the design, it interprets, and creates, its meaning. Some solutions may be outside of the targeted space (A, C, D) and one may be interpreted more accurately as the designer intended (B).